Jadielady: DING! 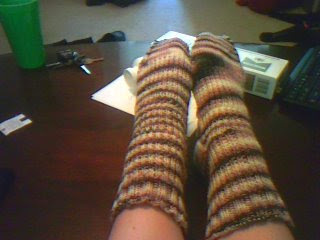 Socks are done! They don't match... the stripes on one are wonky and there's some pooling on the toe, and one's longer than the other but I DON'T CARE!!!! They're mine and I made them and they're super comfy and YAY! I can't wait to knit more. Oooh yay! Welcome to the wonderful world of sock knitting. If I wasn't hooked before, I sure am now. So does this mean you're going to move on to mittens now? I've been waiting forever for mittens. Your socks are wonderful and being a little wonky just gives them more character. Pat yourself on the back and CONGRATUATIONS!